Ready for Dessert — What the Fruitcake?! Before heading off for our holiday in South Africa to visit family, a few dates were already spoken for and on the calendar. One event being my aunt-in-law's birthday tea. I thought it would be nice to spoil the family in SA with some baking as they're always only ever seeing photos and reading about what I've been up to, but being a 12 hour flight away, not able to actually enjoy any of the sweet treats I make. So I offered to bake a cake for the day. With David Lebovitz's "Ready for Dessert" in my hands, I started thumbing through the recipes to see if there was something in there that would be perfect for the day. Chocolate Orbit Cake? Plum-Blueberry Upside-Down Cake? Fresh Ginger Cake? Or how about the Maple-Walnut Pear Cake? So many to choose from! I had to narrow it down. The Mortimer's are chocolate lovers. Me, I like white or milk chocolate. The Mortimers absolutely LOVE their dark chocolate. I wanted something with a bit of both, rich chocolate for the chocolate fiends, and something less intense for those who prefer something more mellow (like me!). Chocolate Pavé? Chocolate Cherry Fruitcake? Then I had a good look at the Banana Cake with Mocha Frosting and Salted Candied Peanuts. It looked to be a good balance. We all love banana bread, we all love nuts and there was some good strong chocolate thrown in just to make it perfect. I e-mailed my mom-in-law and asked her if Aunt Jill might like it and I got a positive reply. Sorted! Ok, now I didn't actually take the book with me to SA, not to be funny but it's not exactly a light little thing. Great for my bookshelf at home, not so great when trying to get everything you need into the 23kg limit! So I copied down the recipe and had it ready for our trip. I won't go into what other baking related goodies I had in my suitcase, you might call me obsessed or something. I'll tell you something, this cake really surprised me. I'd tried some of the crumbs and offcuts of the sponge, it was nice, ok, pleasant. I tried some of the chocolate glaze, it was ok, a bit strong and a little too bitter for my liking, but ok. The candied peanuts, well, those were good from the start and I'm planning on making those on their own just as a snack. I was feeling a little uncertain about the cake from tasting the individual components, but we boxed it up and off we went for an afternoon birthday tea. The cake was brought out and we all sang happy birthday, then the chocolate lovers who'd been eyeing out the rich chocolatey glazed cake dove straight in. From the very first bites there were sounds of "mmmmmm!!!!" and eyes rolling up towards the heavens in bliss. I had pretty much the same reaction when I finally got my slice of cake. Can you believe that I didn't take a single pic of the cake?! Thankfully one of the other Mortimers did! Moist banana cake with pecan nuts combined with the rich coffee and chocolate glaze and those oh so friggin good candied peanuts. Moist, crunchy, smooth, sweet, hint of cinnamon. This cake was amazing! Not only are the Mortimers asking me for the recipe, but the families of Mortimers married in are also asking for the recipe after having some of the leftover cake. I've broken several diets! I don't normally focus on just one recipe from a book I'm reviewing like I would if I was posting a recipe, but I just wanted to share my first experience with "Ready for Dessert". But with all the reviews I do, let's go back to the start (of the book). After an introduction from David Lebovitz is what I always find useful in any new recipe book, the authors notes on ingredients and tools needed. I especially like it when an author makes notes on ingredients because each author will have a preference on ingredients and the recipes in the book will work best with their choice of ingredients. Type of chocolate, flour, dairy etc. Then we're into cakes! 29 of them! Chocolate for chocolate lovers, fruit filled ones and other interesting cakes like Polenta Cake with Olive Oil & Rosemary, Bahamian Rum Cake, Pumpkin Cheesecake with Pecan Crust & Whiskey-Caramel Topping and Guinness-Gingerbread Cupcakes. Included in this list is of course the life altering banana cake that the Mortimer clan devoured. 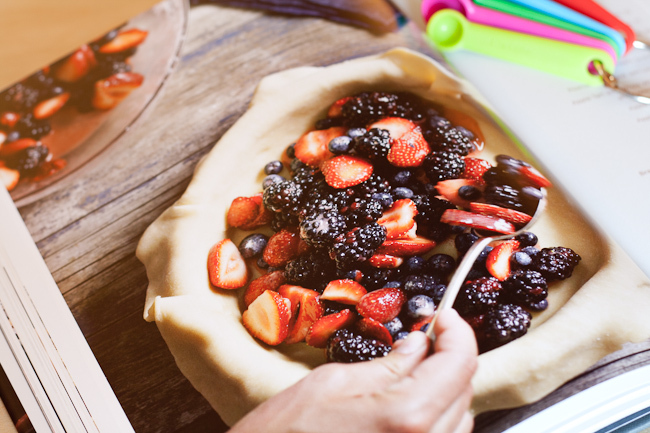 Next, "Pies, Tarts and Fruit Desserts". Creamy pies, fruity tarts and other interesting desserts. On my to-do list, just for starters, are Banana Butterscotch Cream Pie, Peach-Amaretti Crisp and Summer Pudding. In the "Custards, Soufflés and Puddings" section you'll find tasty treats like Coffee Caramel Custard, Chocolate Ganache Custard Tart, Creamy Rice Pudding and Apricot Soufflé. Just four of sixteen other delicious desserts. Any David Lebovitz follower will know that David is particularly known for his ice-creams. In "Ready for Dessert" there is a healthy section of 32 frozen desserts, ice-cream included. Vanilla, caramel, chocolate, Mexican chocolate. Sorbets include wine grape, blood orange, sangria, watermelon sake and simple cherry. Like I mentioned, this is a fairly large cookbook and we're only 2/3 of the way through and if you haven't clicked "order" yet on whichever site you're busy perusing in the background, maybe some of the next treats will convince you. On to "Cookies and Sweets". Chocolate Chocolate-Chip, Black and White Cookies, Cheesecake Brownies, Gingersnaps, Almond and Chocolate Chunk Biscotti, Spiced Candied Pecans and Chocolate Port Truffles. To wrap it all up David includes a section of "Basics, Sauces and Preserves". How to make a prebaked pie shell and various doughs. 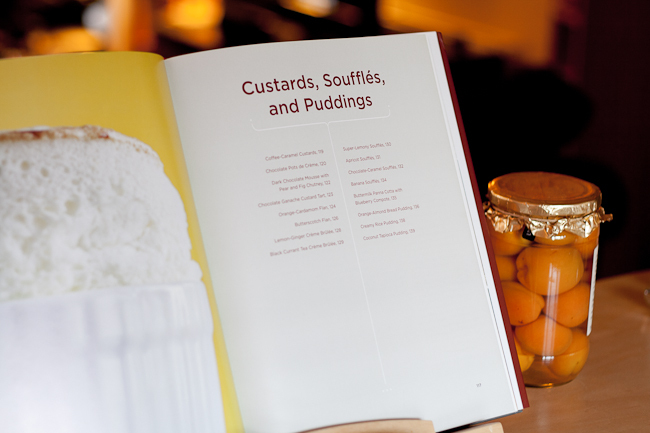 Also some of the must have recipes like pastry cream and créme anglaise. Also delicious sauces like cognac caramel, tangerine butterscotch and the more traditional like dark chocolate sauce. There's also a tasty selection of fruit sauces great for pouring over ice-cream and cakes. David's even included a few marmalades and jams. The recipes are clearly written and explained. 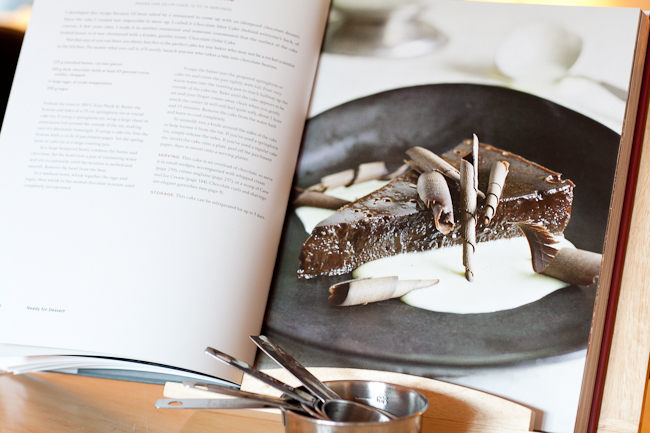 David puts his years of experience as a pastry chef into creating these delicious recipes that you know you're going to enjoy, and with his added tips, tricks and advice written alongside each recipe, you're in good hands. One thing that I like in particular is that every recipe is done in grams, millilitres, litres etc. There is the occasional spoon measurement but no cups in sight. The reason I like this is that there's no room for error. 125g of flour is 125g of flour. 1 cup of flour can range anywhere from 115g to 150g depending on how you filled the cup. That said, if you're planning on buying this book for the occasional baker who's not likely to have a scale, you should probably buy them a scale along with the book ;) I know it seems inconvenient to some to measure on a scale but any serious baker will tell you it's the best way to get the same result each time, so a big thumbs up in my eyes! 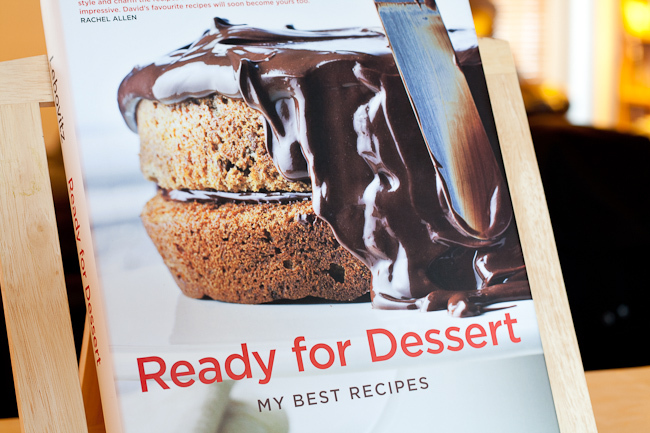 "Ready for Dessert" is a combination of revised recipes from David's previous cookbooks as well as some new ones that are favourites of his that he uses again and again. So if you're a fan of "Room for Dessert" and "Ripe for Dessert" you're going to love this book. 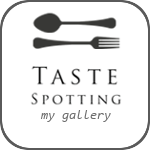 Posted on November 2, 2011 by Mandy Mortimer and filed under My Bookshelf, Review and tagged Book Cookbook David Lebovitz My Bookshelf Review.